Pastor Ndinga wakes early to go check the traps he’s set in the rain forest. Like most Pygmies, he’s learned how to hunt, setting traps along forest trails. He returns home, changes clothes, grabs his Bible, collects one of his disciples, and the pair visit a village church. They coach and encourage the leaders and disciples to grow in faith. He often conducts a Discovery Bible Study (DBS) or two, and coaches people in the process. When he visits, he’s looking for persons of peace, always looking to launch another DBS. Ndinga’s goal is to see every Pygmy village transformed by the Spirit. Previously, a pastor named Bonane came to Ndinga’s village to distribute clothes and food. He spoke of the need for a school for Pygmy children. He had a plan to help meet that need. Ndinga was surprised that anyone wanted to help. The term “Pygmy” describes those tribes where the average height of adult males is 4’11” or less. They are scattered across 14 countries in Africa, but most of the 984,000 Pygmies live in six Central African countries. Historically, Pygmies have been marginalized by governments and are often mistreated. 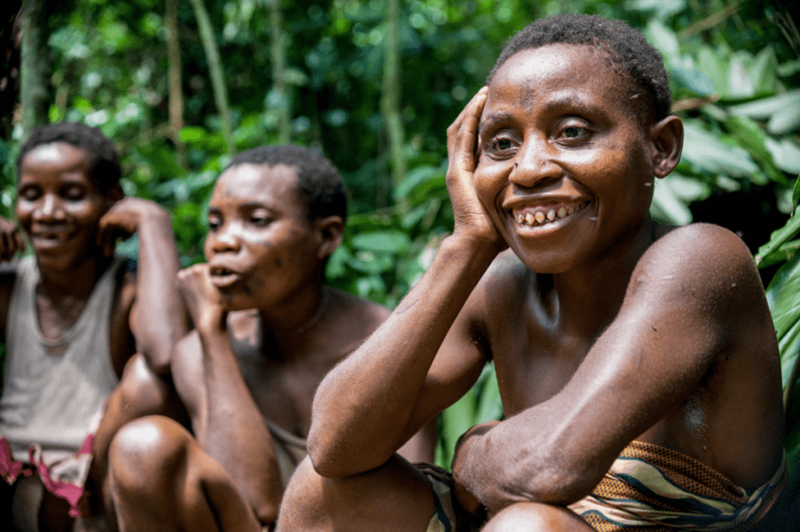 Pygmies are sometimes not considered citizens, are denied identity cards, get evicted from their land, and do not receive proper health care or education. More than twenty thousand pygmies died during the Rwanda genocide and the Congo civil war. According to experts, churches among other people groups in Central Africa have had trouble accepting Pygmies as fully human. They have remained, largely, unreached. Ndinga decided to learn about Bonane’s God. He asked many questions. Bonane patiently answered. A week later, Bonane showed Nidinga and others how to conduct a DBS. For several weeks they met, heard Bible stories, asked lots of questions, and shared what they discovered. Eight group members became Jesus’ disciples. Others refused, saying, “Bonane’s God is foreign.” But, Ndinga and the seven others were baptized. They kept meeting. Ndinga kept meeting with Bonane. During one of their sessions, he said he had been sharing Jesus stories in another village. So, Bonane coached Ndinga to start a DBS under Bonane’s supervision. Pastor Ndinga has never stopped helping people become disciples of Jesus, coaching them to reach out to others. After one year, 14 churches were launched, through three generations of multiplication, and 25 Discovery Bible Studies had been formed. Over 270 pygmies had become disciples! By December 2015, the movement birthed in these two communities had spread to one more Pygmy community and other people groups. 58 churches had multiplied through 9 generations with more than 600 new Christ followers. By December 2018, this Pygmy multiplication has expanded to 6 African countries where 2,816 churches have been planted, to the 10th generation, and 145,755 Christ followers. The people some did not accept as fully human have become agents of God’s Kingdom. They may be small in stature, but Pygmies loom large in the Kingdom story being written this century.